Super Bowl whatever (okay, LIII — I can Google) happened last night and though I don’t partake in such fare, I was smart (bored) enough to pop onto the Twitters to check on world affairs (people snarking), thereby catching the new Avengers: Endgame spot almost simultaneously with the sportsball fans. Way to upstage football, Marvel Cap! 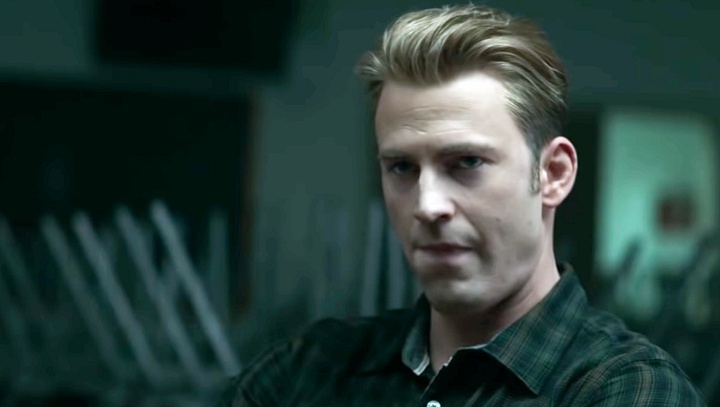 I’m pretty sure Chris Evans used every single facial muscle here. If you didn’t catch it, here’s a close up shot of Steve’s hand shaking as he straps on his shield, which should leave you likewise shook. Almost as bad is the opening montage, reminding us of all we lost, that is, if you’re the sort who thinks we actually did lose them (I am not). … Natasha, Steve, Bruce and Rhodey look up at something — is it Thanos, or a spacecraft/plane? Friend or foe? Depends upon whether it’s the same person(s) Rhodey and Ant-Man later encounter, as they’re clearly on the defense (or about to go into attack mode). … Nebula’s own hand? Is she repairing or removing something? Rocket enters some kind of shack — who or what’s in there? I’m assuming this is a safe place, since he goes in without weapons drawn. And, is it just me, or do Thor’s eyes look glassy, as if he’s about to cry? Where is he? This looks like a destroyed ship. Hawkeye’s come upon something — or someone — with a red glow. Here’s hoping Vision’s back (along with everyone else).